Work crews broke ground on Tuesday, September 4, on the site of a community labyrinth near the Forest Service kiosk on the "triangle" at the west end of Sisters. The groundbreaking is the latest step on the path of the Sisters Community Labyrinth, a project of the Ford Institute Leadership Program, Sisters Cohort 3. The Ford Family Foundation provides training classes based on the belief that vital rural communities develop from a broad base of knowledgeable, skilled and motivated leaders, a diversity of effective organizations, and productive collaborations among organizations. After the training, each class, or "cohort," designs a project to benefit their community, raises funds to support it, and implements the project within one year. This year, Cohort 3 of the leadership program chose to work to build a labyrinth. A labyrinth is an ancient symbol that combines the imagery of the circle and the spiral into a meandering but purposeful path. Walking a labyrinth represents a journey to our own center and back again out into the world. Enthusiasts say that walking a labyrinth quiets the mind, slows the heart rate, promotes relaxation and helps people tap into their creative energy and "think outside the box." Labyrinths have long been used as places for meditation and prayer. They promote health and wellness and serve as a site for relaxation and meditation. The Sisters labyrinth is a seven-circuit Chartres design, measuring approximately 60 feet in diameter. The setting is property owned by the U.S. Forest Service, a small triangle of land where Highways 20 and 242 meet (across from Les Schwab). It is easily accessible and affords inspirational mountain views. There is parking and restrooms on site. 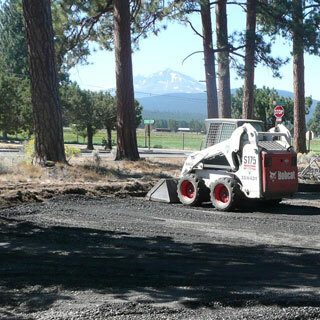 An existing agreement with the City of Sisters provides maintenance, and the labyrinth is permitted by the Forest Service and approved by the city. Tuesday's groundbreaking included removal of a few small juniper trees, as well as leveling the site, and installation of gravel base and topcoats. The topcoat will be chip-seal, to allow for pedestrians and those in wheelchairs. Permeable surfaces will limit runoff, and native grasses are planned for the space between the paths. These design elements mean that ongoing maintenance of the labyrinth will be minimal. The labyrinth and its access paths will be wheelchair-accessible. A three-dimensional "finger labyrinth" will be available for those who are unable to complete the labyrinth circuit for reasons such as sight impairment, or who prefer to gain the benefits of the labyrinth without moving through on-the-ground paths. Interpretive signage will explain the labyrinth for those new to the concept. Signage is currently in the design and production phase. When the labyrinth is completed, Sisters will benefit from another unique gathering place, where various community groups can interact, share the experience, have fun, solve problems, and resolve conflicts. As a potential tourist attraction, the labyrinth will add to the ambiance of Sisters while increasing revenue for local businesses. There is even a Labyrinth Society that attracts and promotes regional labyrinth tours, and the Sisters Community Labyrinth will be registered with it. Sisters Park & Recreation District is the fiscal agent for this project. All donations for the project are tax-deductible. Following presentation of the labyrinth to the community, it is anticipated that a "Friends" group will be established to provide ongoing oversight and maintenance. Congratulations on your new labyrinth. I'm an FILP graduate in North Curry County and heard about your labyrinth at the Ford CAT Summit in Bend last June. Am also on the board of Labyrinth Network Northwest, a Pacific Northwest regional group with members from Northern California to British Columbia, Canada (and even as far as Australia!). We belong to The Labyrinth Society too and encourage you to visit our local website, LabyrinthNetworkNorthwest.org. Good luck and I'm sure people are going to LOVE your new labyrinth. Hope I can get out to Sisters some day to see it. This comment has been hidden due to low approval.